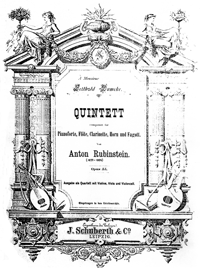 Anton Grigorevich Rubinstein was born in the republic of Moldavia on November 28th 1829. He studied the piano from an early age, making his first public appearance at the age of nine. During an illustrious career as a professional performer (as a pianist he was equalled only by Franz Liszt) he played throughout Europe finally settling in St Petersburg, founding the Conservertory there — the first music school in Russia. It is said that people would queue for hours to obtain tickets for his concerts, with some enthusiatic fans even climbing into the chandeliers in order to see him perform. As a composer Rubinstein was, by any measure, prolific: his compositions include six symphonies, twenty operas, five concertos for piano, two concerti for 'cello and one for violin. 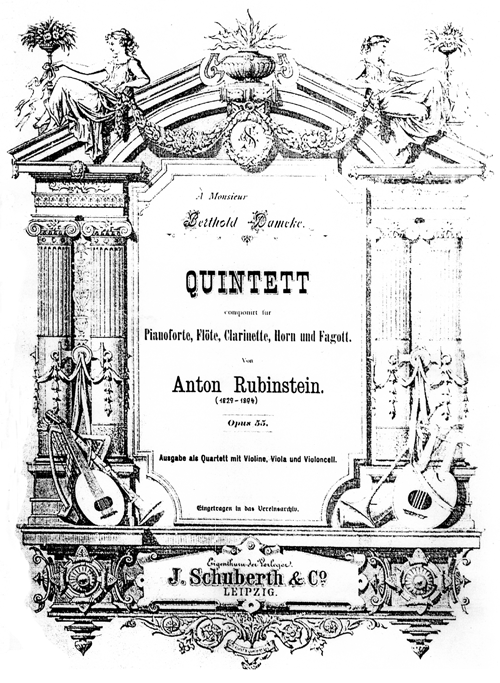 As well as these there are a large number of works for piano and many chamber works of which this quintet for piano and wind is one. He did not follow the classical pattern of oboe, clarinet, horn and bassoon that Mozart and Beethoven had used. Rather, he dropped the oboe in favour of a flute —in the same way that Rimsky-Korsakov had for his Quintet in B-flat (1876). Whether either composer influenced each other on their choice of instruments is unclear.